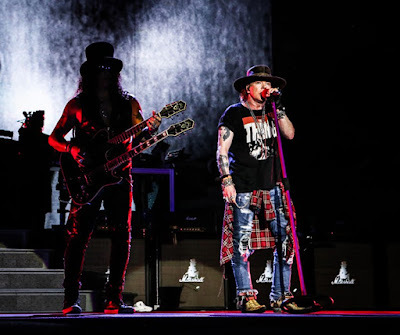 Guns N’ Roses played the first of two shows at Dodger Stadium in Los Angeles on August 18 and footage from the concert has surfaced online. The tune was last performed in Mexico City during the group’s series of spring shows in April. Guns N’ Roses will play the second of two shows at Dodger Stadium in Los Angeles on August 19 (tonight) before playing the summer tour finale at Qualcomm Stadium in San Diego, CA on August 22. The group will launch a South American tour in Lima, Peru on October 27 and have just announced dates for tours of Japan and Australia in the New Year.